Sometimes the mass-produced Zelda merchandise isn't enough! That's why I have a collection of fan made items that fill my ever growing Zelda void in my heart (container.) ;) Some of these items are made by myself (which you can purchase from my store!) while others are made by really awesome Zelda fans who are out there trying to spread some LoZ love like me! Other Info: I have gone through a few versions of the Spiritual Stone set. This particular set is 3D and features the stones' designs on both sides of each prop. I also have the same stones in a psuedo-2D style, which only features the design on one side. 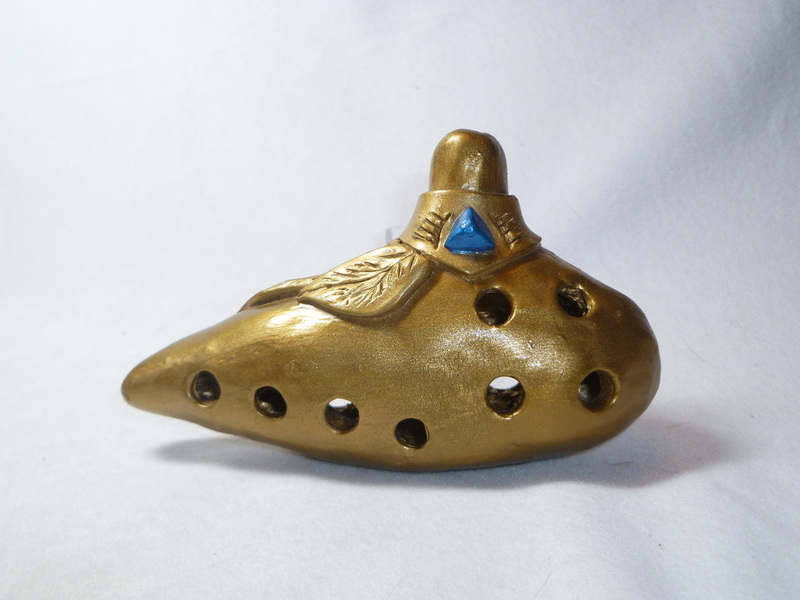 These are styled after the Nintendo 64 model of the Spiritual Stones, since I preferred the geometric and gem-like qualities over the Ocarina of Time 3D smoother Spiritual Stones. Characters: Link, Princess Zelda, Spryte, Ganon, and others. Other Info: Directed by: Joel Musch. Music by: George R. Powell. Also located in Misc. Zelda under Zelda Media. Other Info: I was given a teddy bear for some reason or another at one point. I was going to just give the bear away, but then I decided to modify him and make him a Link Bear! The shield he is using is an extra Ocarina of Time Shield Mint container I had. Other Info: I held a contest in the summer of 2012 where the contestants were asked to make fan art based off of any of my cosplays or crafts in 2012. This is actually the winning piece from the contest, where deviantARTist Keytarist made an adorkable COSPLAYING PLUSHIE OF ME! *Heart melts! * She made a little me with 5 different cosplays that I have done (with the exception of my Rapunzel one that wasn't finished when she created the plush.) If you would like more information on how she made the plush, swing by and check out her entry at: http://keytarist.deviantart.com/art/It-s-Dangerous-to-Go-Alone-Take-This-317365997. Companion Material: An interpretation guide to the deck with card images, meanings and sample spreads is available separately. This set is also listed in my Cards Collection. Character(s): (Smash Brothers) Sheik, Princess Zelda, Ganondorf, Link, Toon Link, (LoZ: TP HD) Wolf Link, (30th Ann) Link: Twilight Princess, Link: Majora's Mask, Link: Skyward Sword, Link: Ocarina of Time, Toon Zelda: The Wind Waker, Toon Link: The Wind Waker, Link: The Legend of Zelda, (BotW) Bokoblin, Zelda, Guardian, Archer Link, Rider Link, Mipha, Revali, Urbosa, Daruk.